It’s been a while since my last official post and I was planning on coming back sooner. However a blend of situations have happened (both negative and positive). But with all that aside I was finally able to complete this blog post that I’ve been planning and promising. To live a life without encountering any toxic people could be considered a fable of sorts. In reality, it is highly likely that toxic activity will cross your path one way or another. While such a thought is a pessimistic one, it is a realistic one to hold and by keeping that in mind you can be better prepared. There have been a few people in my life who crossed certain lines and boundaries with their toxic thoughts or actions. From two-faced friends to shady business personnel, my experience has been…colourful. The extent of my experience can’t be described as horrifying, to be fair, but the name of the game here is that you shouldn’t have to put up with toxic people in any capacity. Obviously, toxic people and their ways are by no means limited to us with dyspraxia. Although, with our kind nature and certain difficulties it can be said we seem to have an ability to attract the toxic individuals ~ like sweet honey to bears. Anyway, raising these difficult issues add depth to the dyspraxia picture and bring about more awareness. 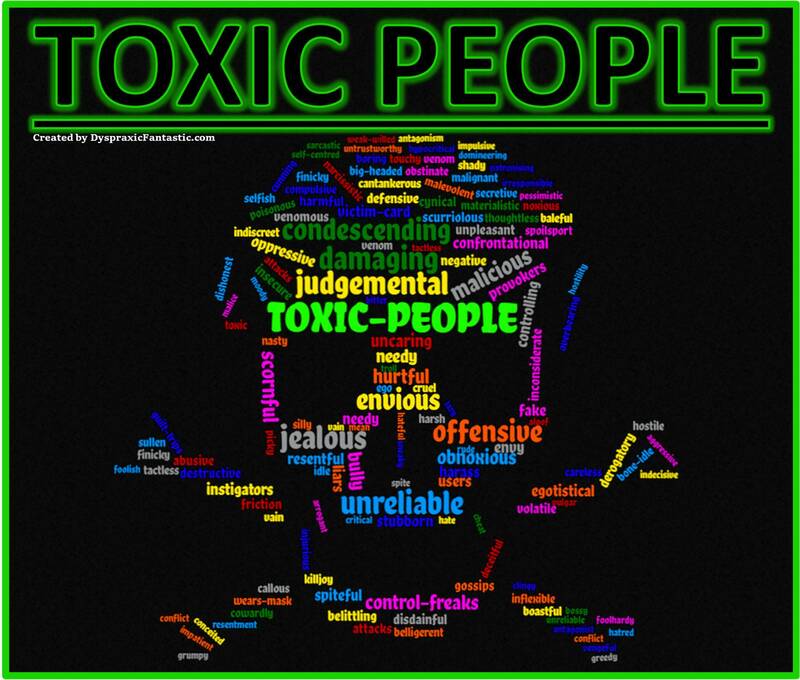 Originally, I had planned a post on the factual background and information about toxic people, however, with the importance and abundance of information, I thought it made more sense to separate it into an actual page. I can use the post space to go into depth into my own experience(s) and how I tackled them. Every situation faced by anyone is going to be different and one solution may not work for another issue ~ even if the circumstances are similar. Follow this link: dyspraxicfantastic.com/toxic-people/ if you like to read more about Toxic People. It’s one of those things that I stand out like a sore thumb – I’m not good at flying under the radar. When someone stands out, for whatever reason, it attracts all sorts of people. This, unfortunately, includes people who like to wind others up. While on a short course for an apprenticeship I found myself with several people who you would guess didn’t really want to be there. They were obviously frustrated and decided to take it out on me because I seemed an easy target. I decided to take up these issues with the tutor who didn’t seem to know what to do. Her knowledge of dyspraxia was limited too despite having a friend who has dyspraxia. I don’t hold it against her as it only served as a piece of the catalyst for my blog. For some reason, the people did cause me a little distress but because the course was only 3 weeks it helped develop my thick skin. Ignoring and moving on was the best course of action as I had an easy and destined escape. There was little point in disturbing the hornet’s nest. I’ve given one example of a toxic situation that I faced and I may cover other experiences I’ve had with an explanation on how I dealt with them. Not sure if I should share them at this point, but I will do it if I feel it would be beneficial and won’t be just a ‘filler’ post. If you would like to read more examples then, by all means, let me know. That just leaves me to say a big thanks for reading this post as it’s been a complicated and lengthy one – even after chopping it down!